Florida's Homestead Exemption, the Save our Homes Amendment of 1995 and how property taxes may change on a transfer of title. The Florida Constitution was amended effective January 1, 1995, to limit annual increases in assessed value of property with Homestead Exemption to three percent or the change in the Consumer Price Index, whichever is lower (see CPI history). This amendment is generally known as the "Save our Homes Amendment". No assessment, though, shall exceed current fair market value. This limitation applies only to property assessed value, not property taxes. When a house is sold, the cap and exemption are removed at the end of the calendar year, and taxes are calculated on the full market value, also called the Just/Market Value. The property will fall under the limitations of the Save Our Homes Cap the second year of the new owner's Homestead Exemption. (Therefore, if a property owner applies for and receives Homestead Exemption for 2007, the Assessed Value will be capped in 2008). To determine taxable value, any exemptions are subtracted from the Assessed Value to reach a Taxable Value, which is then multiplied by the yearly Millage Rate set by the taxing authorities to reach the amount of tax due. If additions or improvements are made to the property, the value of those improvements will be added to the roll regardless of the cap. For example, if a pool is added to a property, the value can increase no more than the cap rate, plus the value of the pool. If the Assessor corrects such items as size, number of bathroom fixtures, installation of heat and/or air conditioning, the value of those corrections will also be added to the roll above the cap. On January 29, 2008, Florida citizens voted to pass Amendment 1. 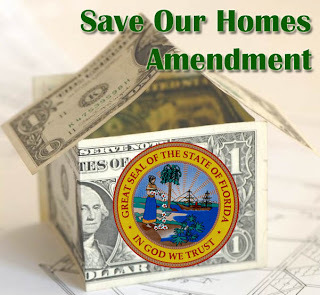 One of the provisions of Amendment 1 allows qualified property owners to "port" their Save Our Homes Cap when they move from their homesteaded property to another Florida property. Another provision increased the homestead exemption. For the November 2008 Florida Ballot there is yet another measure that will, if passed, enact an across the board property tax cut of about 25%. 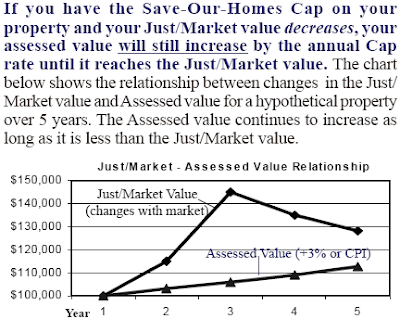 In September 1995, Florida's Governor and Cabinet approved a rule directing property appraisers to raise the assessed value of a qualifying homestead property by the maximum of 3% or the annual change in the Consumer Price Index, whichever is less, on all properties assessed at less than full market value whether or not that property's value increased during that calendar year. If the new owner is your spouse,or someone who is legally or naturally dependent on you, he or she must apply for homestead exemption. Your current Save Our Homes cap will not be adjusted. If the wording of your current deed has consequences that you did not intend, you may want to consider a corrective deed. Please consult an attorney, title company or other real estate professional to help you prepare your corrective deed. The Property Appraiser's office cannot advise you, since there are many serious considerations that go beyond how homestead exemption is calculated, including income and estate tax consequences. It is recommended that you never attempt to change your deed without the help of a professional. Will I lose my Save Our Homes Cap if I remove someone to my deed?